For over 35 years, Nature’s Miracle has been a reliable source of pet supplies. The company stays ahead of its competition by taking advantage of the technological innovations made in the last decade and applying them towards the overall design of its Self-Cleaning Litter Box. When it comes to cleaning your cat’s litter box, you no longer even have to lift a finger because Nature’s Miracle Self-Cleaning Litter Box will ensure your cat’s bathroom is sparkling clean. All that’s required on your part is to occasionally throw out the waste collected over the past couple of weeks. 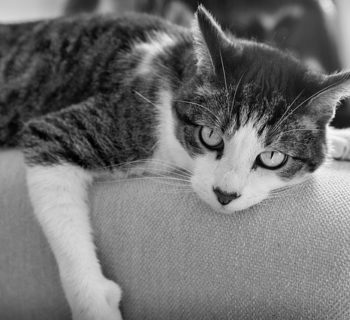 Continue reading for an in-depth look at how both you and your cat can benefit from Nature's Miracle Self-Cleaning Litter Box. What to Look for in a Self-Cleaning Litter Box? A self-cleaning litter box makes the life of the cat owner stress-free, but you also have to take into consideration the opinion of your cat. If you’re considering adopting a cat but don’t want to deal with the smell and mess of litter, the only viable solution would be to purchase a self-cleaning litter box. A cat can adjust to using this type of litter box, but it will take some time. Remember to be patient because, within a three-day time span, your cat will be jumping in and out of its automatically operated litter box with ease. 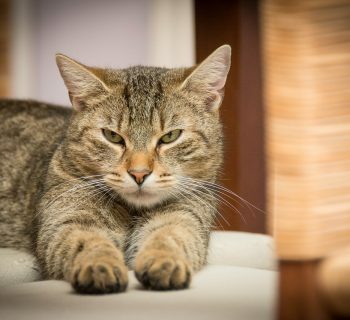 Your feline friend will appreciate how quickly the litter box gets cleaned, but the mechanisms involved in removing the waste will take some time for it to get used to. Nature's Miracle has taken the hassle out of cleaning your cat’s litter with its Self-Cleaning Litter Box. Cat owners who spend most of their day at work no longer have to come home to litter full of feces and urine. This litter box comes built with advanced cleaning technology that ensures the litter remains clean 24/7. The smart-detection motion sensor functions to scoop any cat waste placed on Nature's Miracle Self-Cleaning Litter Box with the help of the automatic yet removable rake. As long as you follow the directions in regards to usage and storage, you can expect a fresh litter box at all times. 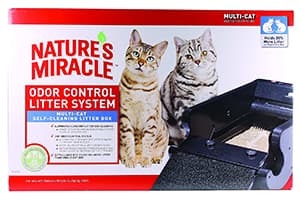 Nature's Miracle decided on a simple design for its Self-Cleaning Litter Box, which makes it extremely easy to use for cats. Keep in mind that your cat will need time to adjust to using this litter box. 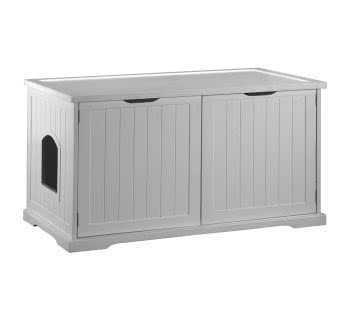 One way you can ease that transition is to place this litter box next to your cat’s old one. You'll want to manually operate the Self-Cleaning Litter Box for the initial two to three days. Most cat owners find that turning this innovative product on for a maximum of three times a day during the transitional period is adequate for your cat to adjust to utilizing its new litter box. After the third day, you’re free to let the litter box to operate automatically. Nature's Miracle Self-Cleaning Litter Box functions to minimize the odor coming from your cat's waste. Cats tend to have a hard time accepting the fact that their owner switched their litter box, so they will try to rebel by making the area messy. This includes scattering litter and tracking around the box. A majority of indoor cats couldn't make a mess even if they tried because the structural design of Nature's Miracle Self-Cleaning Litter Box makes it impossible. For instance, the litter area is surrounded by high walls, which effectively prevents any litter scatters. Your cat will have to go out of its way to try and scatter the litter in this box. Sometimes tracking around a litter box is inevitable since there is no area for the cat to wipe down its paws. 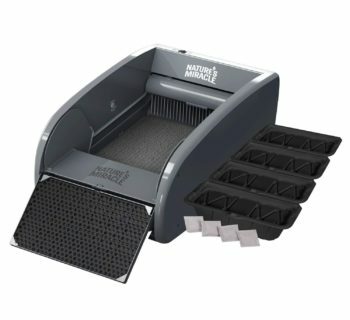 Nature’s Miracle gives your cat the means to clean its paws thanks to the paw cleaning ramp that has a height of 8-inches and a width of 13.75-inches. The ability for your cat to clean up after itself significantly reduces the odor coming from the litter box. The self-cleaning feature of this litter box includes waste containers and carbon filters whose purpose is to contain both mess and odor. Nature's Miracle added handles on each side of the litter box, so you won’t have to strain your back when it’s time to clean the device. 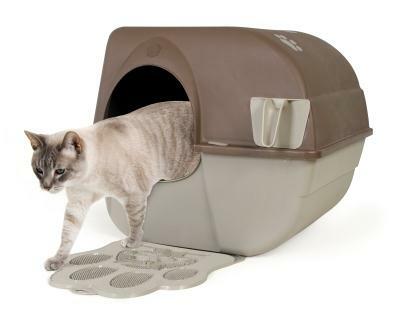 When compared to your standard litter box, this Nature’s Miracle one will feel like a mansion to your cat. 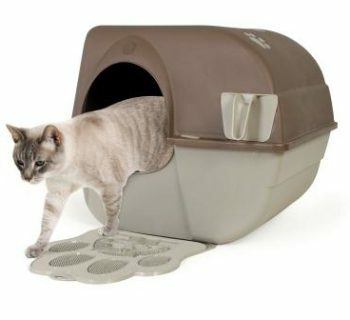 Due to its large size, it to accommodate over 15-pounds of weight, which makes the Nature's Miracle Self-Cleaning Litter Box ideal for multi-cat use. Cleaning a litter box can be a nauseating experience, and it’s all thanks to the ammonia present in cat stool. Cat owners who use this litter box can effortlessly remove the ammonia in the air without having to put their nasal passages at risk. Ammonia is a well-known toxic gas made from a mixture of hydrogen and nitrogen. An environment with a significant amount of ammonia fumes can negatively affect your respiratory system. In fact, cat owners who fail to clean their litter boxes increase the presence of ammonia to the point that they have a hard time breathing in their home. To ensure that your Nature’s Miracle Self-Cleaning Litter Box is operating at optimal levels, you should adhere to the manufacturer’s advice and only use this brand’s litter with this product. This brand specifically designed clumping litter, which is the most sought out litter type in the pet supply market. Each litter piece features a compact yet strong overall structure that tones down the distinct smell of ammonia. 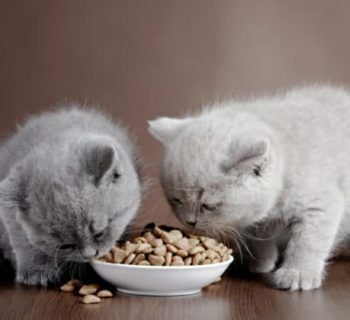 Its one-of-a-kind clumping formula causes the litter to quickly clump together. As a result, it effectively destroys ammonia odors within a matter of minutes. 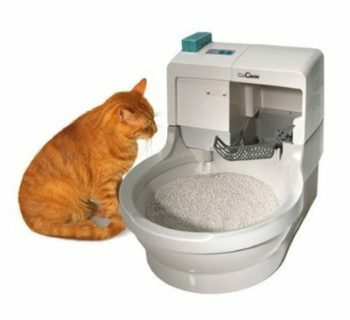 This litter box will automatically dispose of the soiled litter in a specific waste receptacle, which makes it impossible for moisture to build up in the bottom of the litter box. The lack of moisture allows the litter to form hard clumps, so it won't break apart while you try to scoop it out of the container. 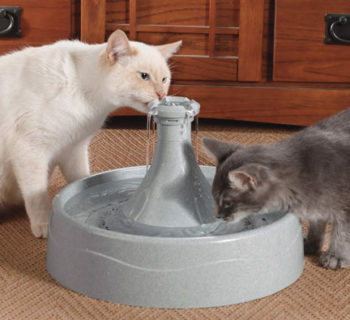 Those using this litter box for one cat can use a waste receptacle for a one-month time span. Nature's Miracle makes sure to include extra supplies of both carbon filters and waste receptacles so for the first couple of months you don't have to go out of your way to purchase additional ones. However, you will have to separately purchase the Nature’s Miracle clumping litter to ensure that this device operates smoothly. Some buyers opt out to use their cat’s preferred litter brand, but they run the risk of having a poor functioning litter box. People often assume self-cleaning litter boxes are a luxury item because they commonly have a high price tag. 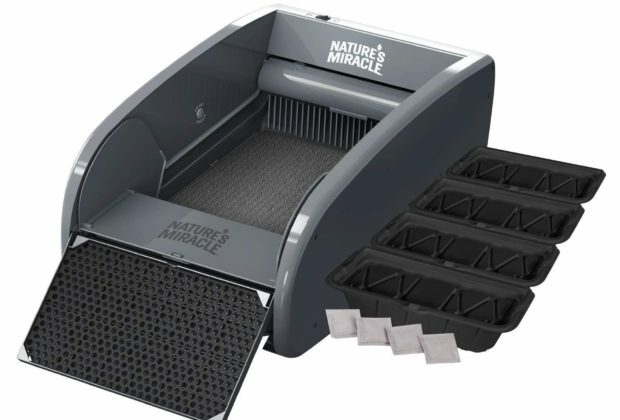 Nature’s Miracle cut down on its manufacturing costs to produce a self-cleaning litter box that costs you less than $125, making it the cheapest option in the pet supply market. The carbon filters are a nice touch since they effectively cut down the scent of cat feces. These filters work together with the antimicrobial protection on the litter box to fight the strongest odors. Some buyers have made complaints regarding the waste removal system of this litter box. Apparently, the device doesn't remove 100 percent of your cat waste, which is to be expected of a self-cleaning litter box at this price range. Nature’s Miracle recommends using its litter brand with this box, which doesn't leave much room for experimenting with other litter brands. If you have an exceptionally stubborn cat, getting it to use this litter box with litter it doesn't agree with is an impossible task. Nature's Miracle Self-Cleaning Litter Box isn’t entirely cat-proof. Cat’s are known to be extremely intelligent creatures, so it won’t take long for your pet to figure out how this machine operates. The buttons on this litter box are easily accessible to your cat, so it can walk on top of the power button to turn off the machine. This is bad news for cat owners who leave for a business trip and rely on the automatic cleaning feature of this litter box to keep the area spotless. Nature's Miracle Self-Cleaning Litter Box is worth the investment because it will come in handy when you travel for more than a week and can’t find anyone to clean up after your cat. You always have the option to scoop the litter manually, so if the machine isn't doing a proper job cleaning the litter, you can take matters into your own hands. Its programmable features combined with its sufficient odor control makes Nature's Miracle Self-Cleaning Litter Box one of the best in the pet supply market.